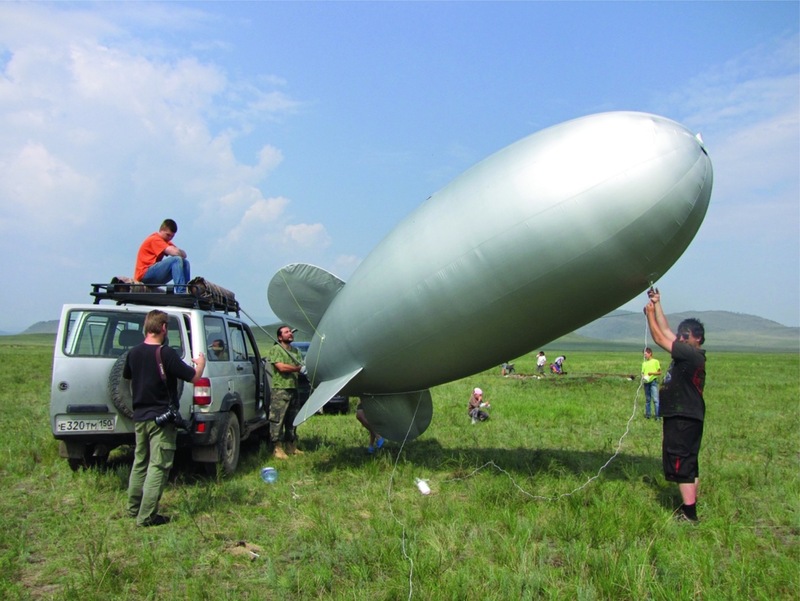 The focus of the Tuva expedition are sites dated to the first half of the 1st millennium BC and assigned to the startup of the early nomad period in the Republic of Tuva. 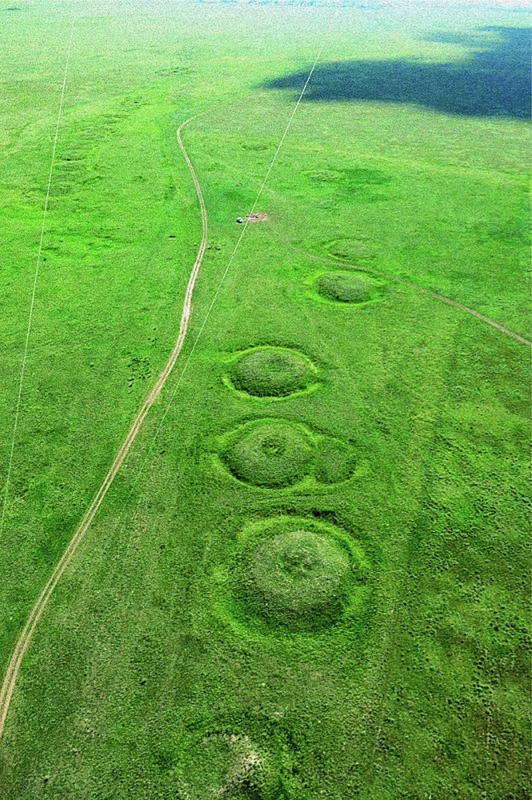 In the course of the 2012–2013 expeditions low-altitude aerial imagery was conducted in the Uyuk River valley of the Turano-Uyuk Depression to explore numerous kurgan mounds, structures covered with kurgans and the periphery of the kurgan fields of Arzhan, Chinge-Tei and to carry out geo-radar surveys of the sites. 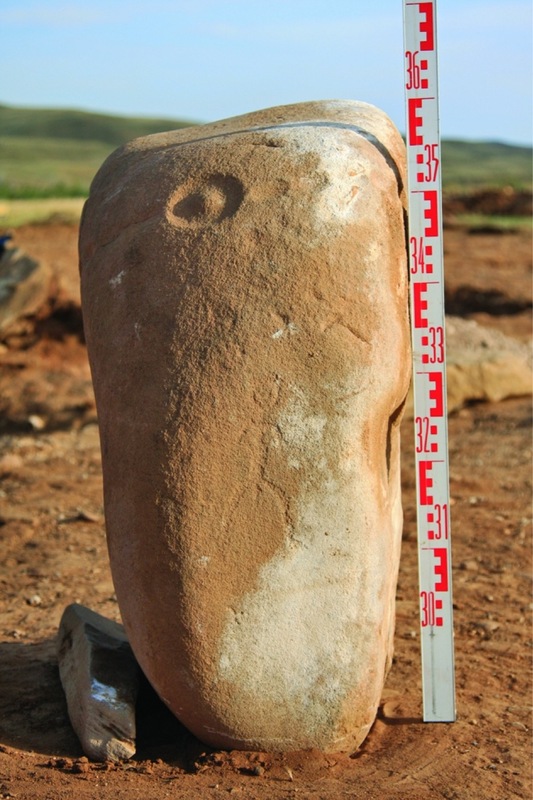 The materials collected revealed new archaeological sites such as Arzhan 5, which is a kurgan in the Tunnug urochishche (area). A burial ground known as Bai-Dag located in the Eerbek River Valley 13 km north the Yenisei was examined. The main complex with remains of a stone facing of the wall is an extended stone embankment measuring 26 by 17 m in size. The embankment was made of slabs placed vertically, forming a structure composed of three circular constructions built successively along the south-north axis, it contained 14 burials of the adults and children made in cysts and hollowed-out tree trunks. Parts of a horse trapping set were found in the embankment. Deer stones were found beneath the mound inside the central construction, they were placed concentrically around the central burial. Four burials of the adults were made in cysts embedded into the rock and roofed with stone slabs. Other buried individuals are children. 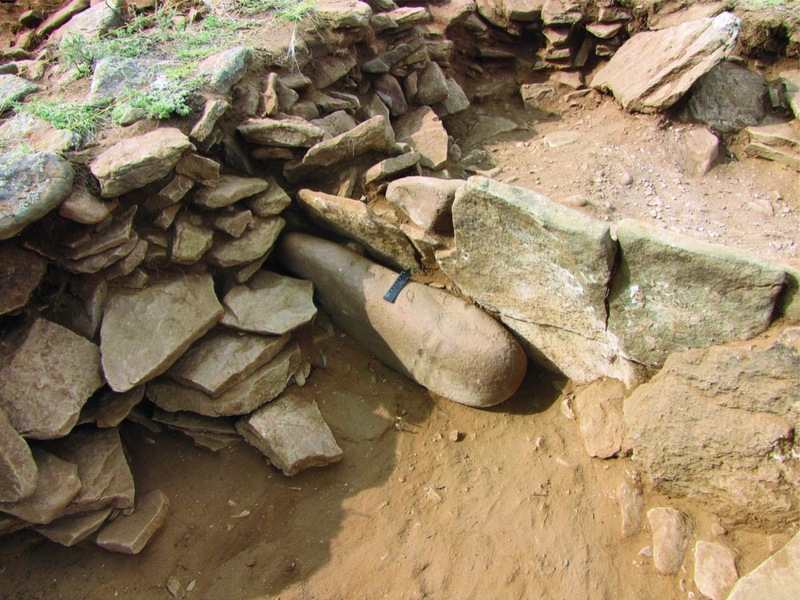 Three central burials were looted in ancient times. The space of burial 1, which remained undisturbed, was filled up with soil only partially. A woman of 45–50 years old was lying in a contracted posture, with her head facing the west. 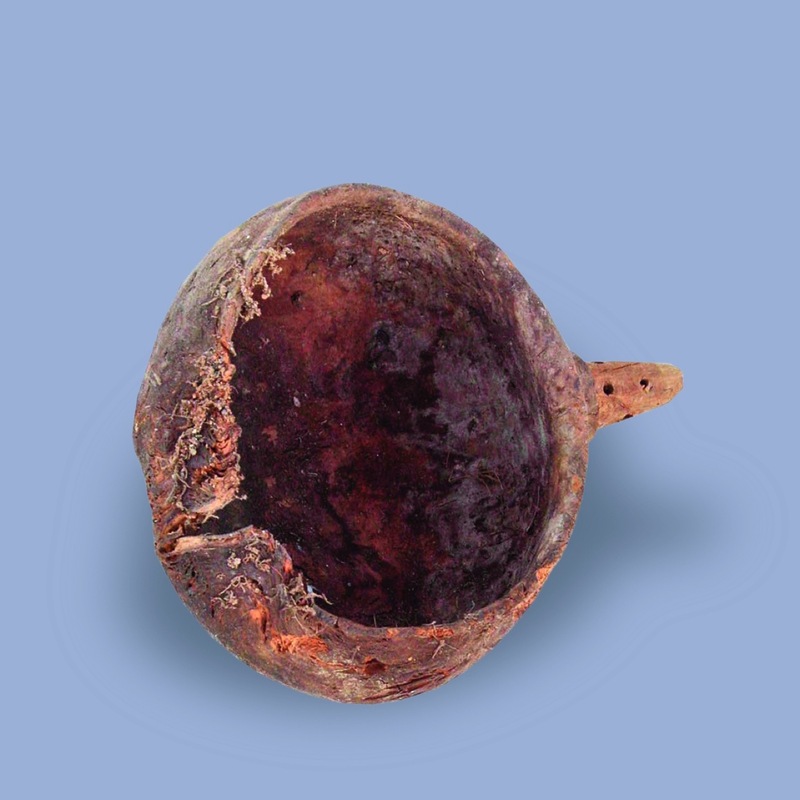 A ladle made of birch tree burl, 12 cm in diameter, was found left of her head, glass beads and a large bead were uncovered near the shoulders. An assortment of items placed into a partially preserved leather case, such as a looped mirror, a bronze awl and a bronze needle; a composite comb made of antler plates with a scratched geometric pattern and wooden teeth; a bone grooved clasp and a fragment of a leather strap with a loop and bronze flattened beads, was found lying behind the back of the dead. 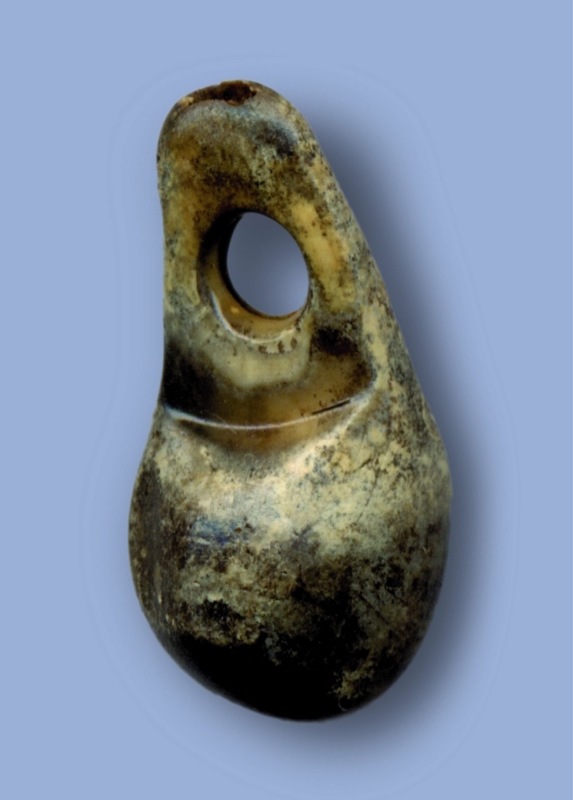 A male of 50 years old was buried in grave 2, a man of 30 years old was buried in grave 3; a woman of 35 years old was buried in grave 5, which contained pendants made from a musk deer tooth, a maral (Siberian stag) tooth; a bronze awl, an eye bead and a slate bead. 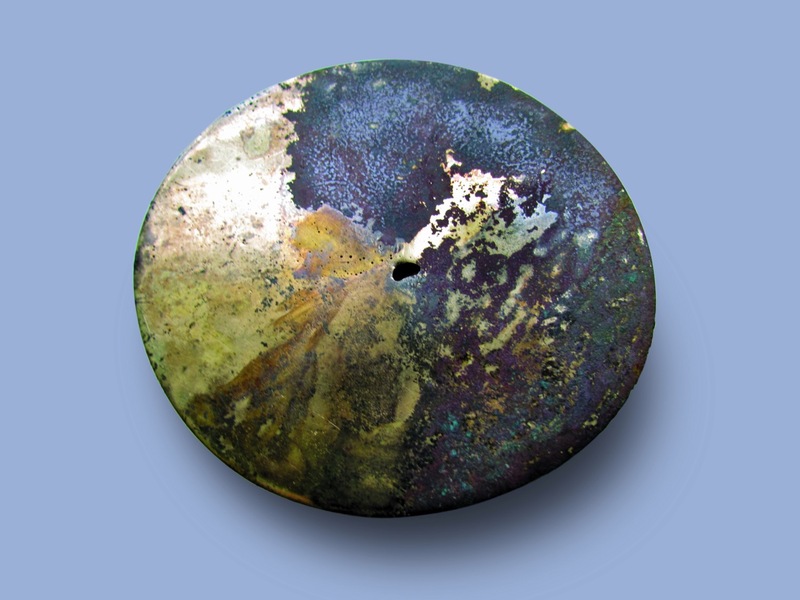 A bronze knife with a ring-shaped top placed in a leather sheath, which was painted with ochre, was found lying near the skeleton of a juvenile in grave 11 near deer stone 2. Graves 9 and 14 were made in hollowed-out tree trunks put in the western sections below the wall. A fragment of a wooden vessel with a handle shaped as a hoofed leg was unearthed in grave 9. 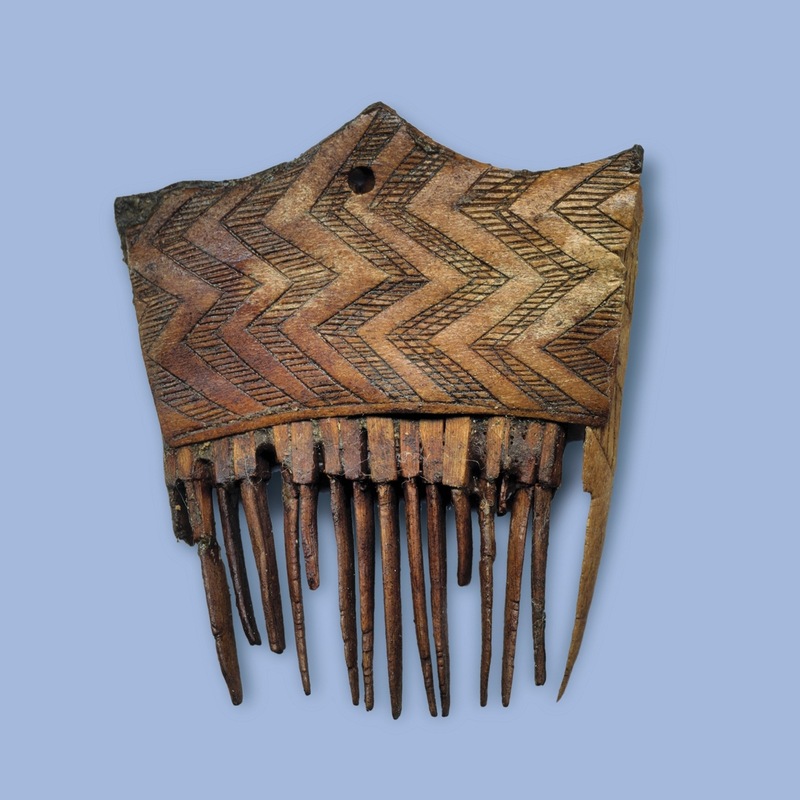 Items from these graves share similarities with items at other Tuva sites such as Saryg-Bulun, Dagee-Baary, Arzhan 2 and Kopto. Based on the architectural design, sets of grave offerings, the composition of the bronze that was used to make the items, and results of radiocarbon analysis, the kurgan can be dated to the Aldy-Bel period, which is the end of the 7th – early 6th centuries BC. 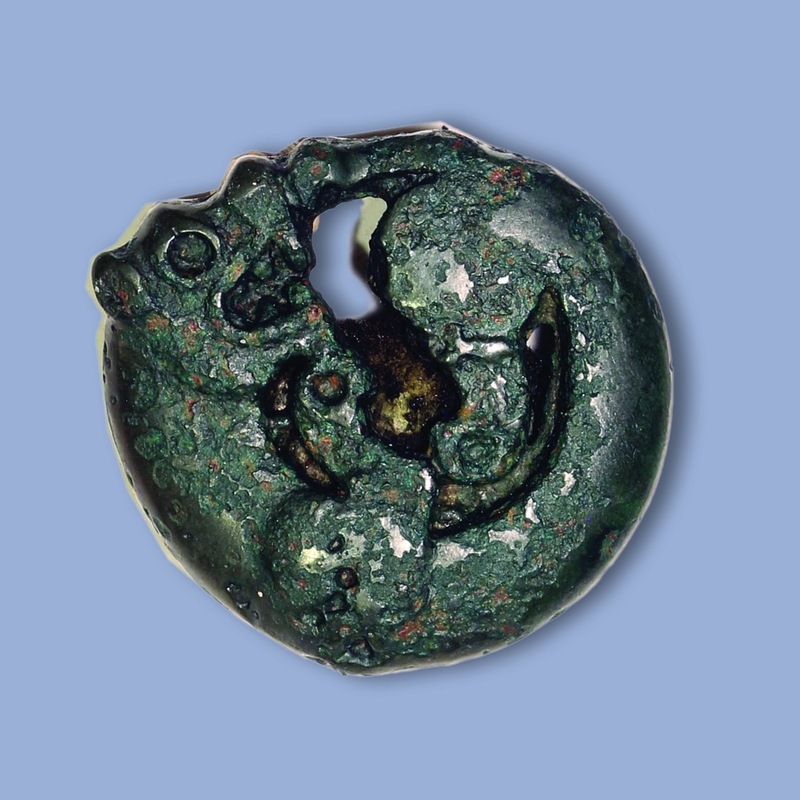 A small stone kurgan near the Village of Chkalovka contained an assemblage of a disturbed burial attributed to the Kokel culture of the turn of the 1st century AD. Explorations have started at Arzhan 5, which is a burial and memorial site with a radial design of the construction beneath the kurgan identified by aerial images. The mound of the site was heavily damaged. 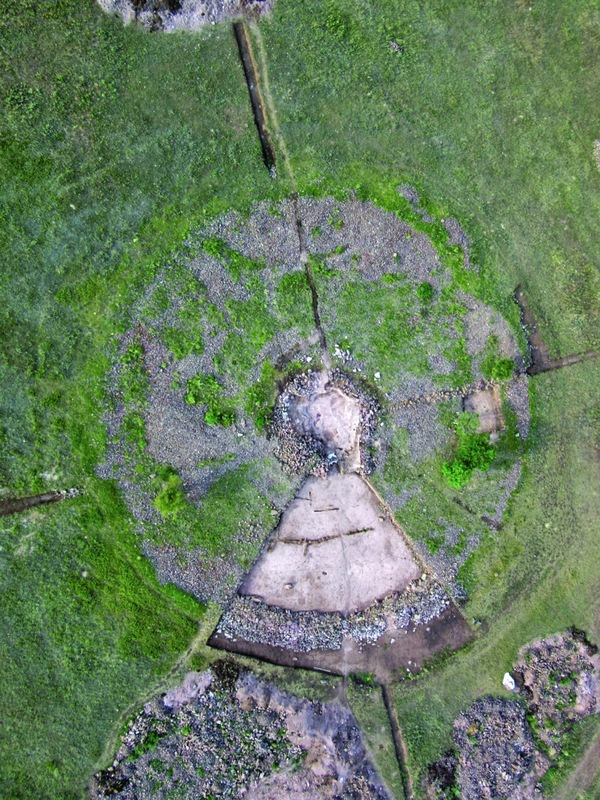 The examination of the mound in four southern sections has revealed several layers of timber constructions under the stone layer that has remained intact. Therefore, the ground plan of the construction may be reconstructed. The site functioned as a special stone mausoleum; it measured around 50 m in diameter and was built on a clay foundation and fenced with a wall made of horizontal slabs. The main burial was located in the center; most likely, it was not embedded into the soil and was made in a wooden construction on a pebble filling. Subsequently it was looted, and a large amorphous crater with deformed edges was formed. The crater revealed human and animal bones, a horn pendant and a wild boar fang, a fragment of a horn bit-piece as well as an implement made of antlers. Wooden boxes made of two-three timber logs placed on top of each other were constructed around the central grave in a circle with a diameter up to 15 m; the boxes were attached to each other, they shared guide beams and were roofed with timber. After the burial was made, a stone embankment was constructed. A wall made of four rows of vertically placed slabs with stone backfilling was erected on the outer side. Fragments of pottery, animal bones and a bone pendant have been found in this place. Radiocarbon analysis of wooden construction remains has placed the site within the range of the turn of the 8th century BC. The studies conducted attribute this site to the earliest period of large kurgan constructions, which is the period when Arzhan 1, a key site of the early nomad history, was built.